When Read It Later relaunched as Pocket last year, I was intrigued by the service’s focus on allowing users to “save everything for later”. 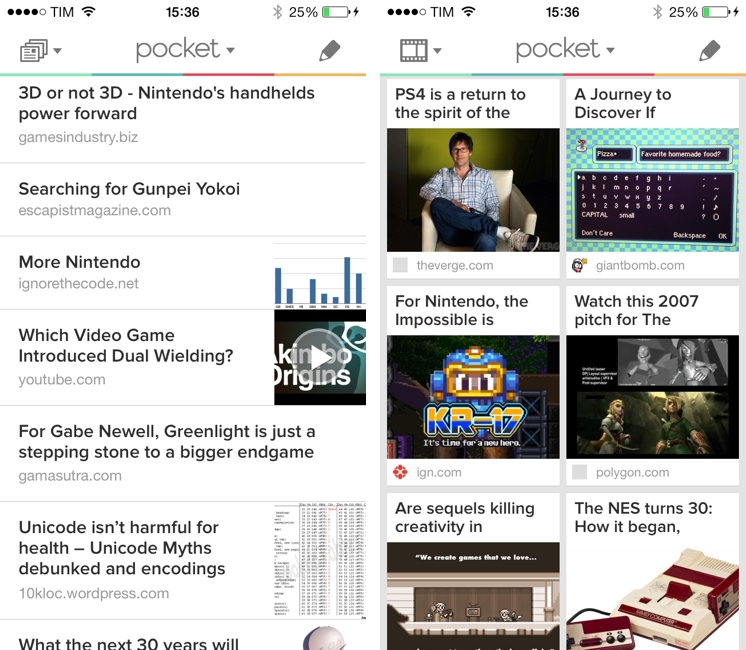 In the months that followed, Pocket received a native Mac app, better browser extensions, deeper integration with iOS apps thanks to a new SDK, and started expanding to more devices and OSes, following Nate Weiner’s original strategy to bring Pocket to as many platforms as possible. Today, Pocket is updating its iOS app to take advantage of iOS 7 and ensuring that content is always available on an iPhone or iPad, even if the app isn’t running. The new Pocket is a good example of developers using the new iOS 7 APIs to enhance existing apps. I use Pocket primarily on my iPhone and iPad: my consumption patterns may vary, but, overall, a clear trend in my routine is that I tend to read on the iPhone when I’m cooking or waiting in line somewhere, and on the iPad when I have time – no matter the context. I like the Pocket Mac app, but I only use it when I can’t read on my iPad (typically, when the iPad is charging). I’m a big Pocket user on iOS, and therefore something that always bothered me, and wished it could be done better, was the fact that, upon launching Pocket for iOS, I always had to wait those few seconds before the app fetched my latest saved items. This is changing today with Pocket 4.6 and Instant Sync on iOS 7. Instant Sync, available for both the iPhone and iPad, uses the new iOS 7 silent remote notifications to automatically fetch new items from your Pocket account, in the background, even if the app is closed. Once turned on in the app’s Settings, Instant Sync will ask you if you want to receive notifications from Pocket, but, in practice, you’ll never get banner or sound notificatons from the app. This happens because, on a technical level, Pocket is using the new iOS 7 background refresh APIs, and, in particular, silent remote notifications, which allow the service to instantly tell the app when there’s a new item saved for later, and download it in the background. This is a power-efficient API that Apple has introduced with iOS 7 and that enables third-party apps like Pocket to always launch with content that is up-to-date and available for user consumption. Using Pocket 4.6 on a daily basis, I’m having the read-later experience that I’ve always wanted from an iOS reading app: instead of having to manually refresh to fetch new articles or being forced to wait while the app is loading my latest items, Pocket launches with an updated list of items that I saved minutes or hours before from a compatible app like Tweetbot or the desktop bookmarklet. Pocket (and iOS 7) take care of downloading new items for me. It’s a complex technology under the hood, but, on the user’s side, it just makes sense: Pocket knows what are the latest items you’ve saved, and now the app can always launch with new items in the list, waiting for you. Again, iOS 7 makes this possible, and once you get used to it you’ll realize this is how things should have always been. With iOS 7, Pocket is also getting a subtle interface update that gets the app ready for the new OS and brings a cleaner reading experience accompanied by performance improvements and a tweaked reading experience. From a design standpoint, the app has been slightly redesigned to fit with iOS 7’s new theme: the Settings have new switches, the title bar in the main screen blends with the status bar (the effect is nice and makes the app feel more spacious), and the read later list has been rewritten to use Apple’s UICollectionView. The end result is a list/grid page that feels snappier and more responsive, although the untrained eye won’t likely notice any change. Changes in the reading experience itself are, on the other hand, well noticeable and practical. Respecting Apple’s guidance for clarity and deference, the reading UI recedes when scrolling through text, pushing the status bar and action toolbar back into the edges of the display, leaving room for more text. If you’ve used Safari for iPhone on iOS 7, the concept is largely the same, albeit the Pocket status bar and toolbar have a nice line separator and custom icons. Text layouts have been rewritten, the Pocket team told me, using WebKit (instead of iOS 7’s new TextKit) to offer better line spacing, automatic adjustments of font sizes, improved margins and line heights without tasking the user with complex configuration screens and menus. The existing font picker panel has been redesigned with simplified controls for serif and sans-serif fonts, sizes, background color, and brightness. In my tests, the best changes were inline images (which now extend from edge to edge) and justified text with “real hyphenation” – the lack of the latter option always bothered me in the old Pocket. 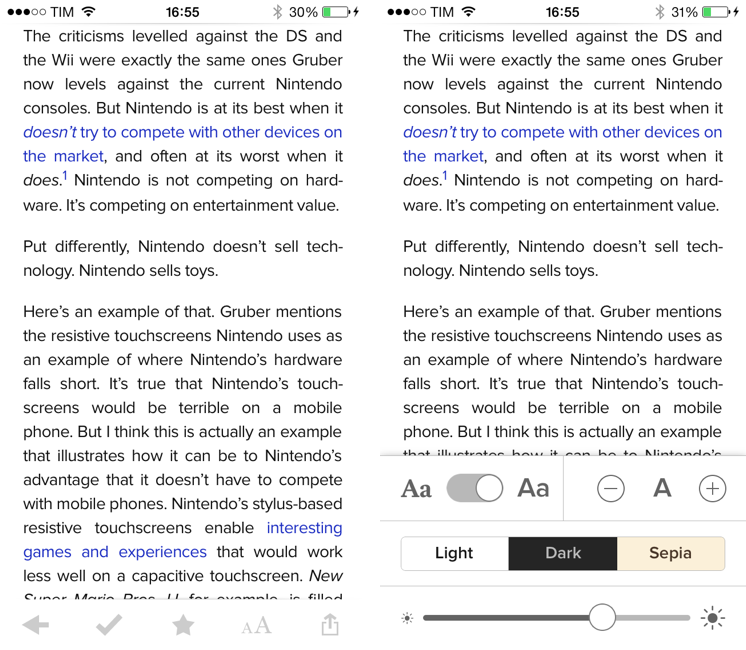 I am no typography expert, but you can see the clear improvements in the comparison screenshot above. According to Pocket, hyphenation and justification are available on about 70% of all articles in Pocket, and the feature will continue to expand in the future. In the sharing department (app actions, user-to-user sharing) nothing has changed. Pocket for iOS 7 looks good, but the clear winner is Instant Sync: it’s a perfect example of how iOS 7 makes complex features simpler for developers and users, and it improves the overall Pocket experience by making your items readily available at any time. 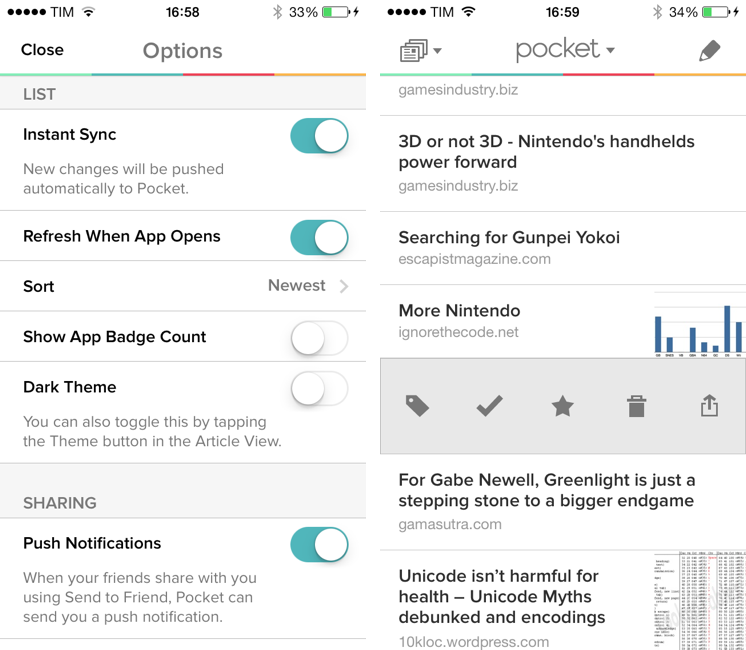 Pocket 4.6 is a free update and it’s available on the App Store.